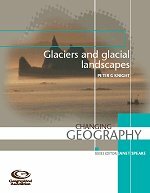 Information about glaciers for anyone who is interested! Intellectual Property, Copyright, and other legal stuff: Material on petergknight.com is produced by me in my spare time using my own resources as a hobby. Teaching materials produced in connection with my teaching at Keele University are available to Keele students on the Keele University web site and, although petergknight.com provides links to that site, materials there are not a part of petergknight.com. All intellectual property rights, copyright, and other rights in material on petergknight.com are retained by Peter G. Knight unless explicit acknowledgement is given to other right holders. Anyone is welcome to use these materials for non-profit educational purposes on condition that they acknowledge the provenance of the material. For commercial use intending users MUST get written permission before using material. This site believes in the free availability of educational materials on the internet.